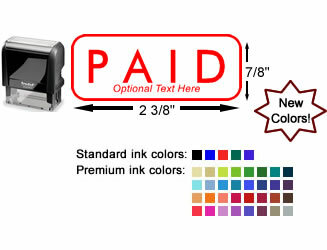 Stamp invoices, documents, company name, mark paid via credit card, check, cash and more. I pay many bills online and I pay my elderly parents bills for them. I had this stamp made up so they could see the bill was paid and the date stamped under it. Makes things easier! 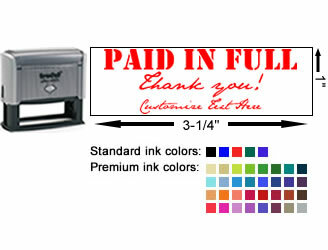 I received my paid rubber stamp in under a week after having ordered it! Always exactly as I ordered and a real time-saver. I had a paid stamp that was unusual by today's standards, but I had been using it or others exactly like it for over 30 years. I recreated it and uploaded it online. The new stamp was identical to my design. I'm very pleased with this product. 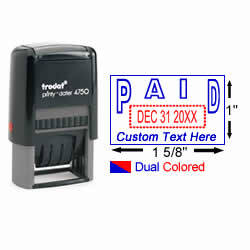 I created a stamp to mark bills "Paid in Full" with lines for approvals, amount, check number, EFT and date. 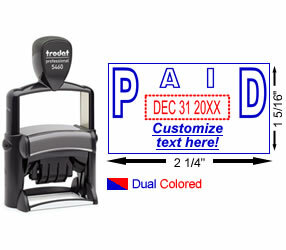 It saves paper and staples and it is quick and easy to read. - Plate size: .5 in. by 1.5 in. - Up to 1 lines additional text. - Plate size: .95 in. by 2.45 in. - Plate size: 1.5 in. by 2.29 in. - 1 in. × 1 5/8 in. - Up to 1 line of text below date. - Plate size: 1 in. by 1 5/8 in. Dual-colored red date, blue exterior date.